Find the answer to some frequently asked questions about our posters. Do I have to pay to display my poster? In order to present your poster at the International Forum you must register and pay the full fee for the two main event days. Students and those from low income countries must also have registered by this date. Please note there are no one day registration options for poster presenters. Information on fees for attending Glasgow can be found on our Fees and Registration page. What should I do if I am unable to present my poster myself? If you cannot present your poster and are sending a colleague you must inform us by email to leastman@bmj.com to ensure that we have a space for your poster display. Please include the full abstract title and the name, email address and organisation for your replacement presenter. Please note that your replacement presenter cannot be already presenting a poster of their own. We have a strict policy of one poster display per presenter. Can my abstract for poster display be written on any topic? We have 7 topics that you could submit to. You will be asked to choose which topic you are submitting your abstract to during the abstract submission process. Please make sure that your abstract matches the topic you are submitting to. Check the list of topics that you can submit to here. What size/orientation should my poster be? Are there any guidelines I should follow? Poster guidelines can be viewed here. What does a poster board look like? When will my poster be viewed? Posters will be viewed on the two main event days, Thursday 28 – Friday 29 March 2019. This year you will have the opportunity to present your poster to your peers on our Poster Stage. The Poster Stage will give you a platform to share your work with delegates during a 5 minute allocated slot. If you would like to present on the Poster Stage, sign-up* before the event will be required. The poster stage has limited availability and slots will be allocated in order of presenters signed up. We can’t guarantee every presenter will be able to present on the poster stage. Further information, including how to present, will be sent to all registered poster presenters. 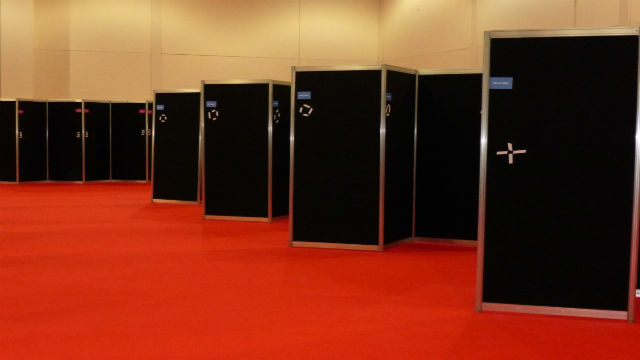 All poster stage sessions will take place in the exhibition hall. These open walk arounds give poster presenters a chance to have personal conversations with delegates about their work. Taking place through every break, we encourage poster presenters to stand in front of their poster while delegates view the poster area. No sign-up is required for these un-facilitated sessions, just be at your poster during the breaks to meet forum delegates and share your work. How do I sign up for the Poster Stage? Authors will be invited to sign up to present their work on our Poster Stage. This invitation will be sent once the presenting author has registered to attend the conference. Once the author has signed up, they will be sent an allocated time slot to present their work. These facilitated posters sessions will allow authors to deliver short presentations about their project and answer any questions from the audience. When can I set up my poster display? Where will my poster/abstract be published? You will have the opportunity to opt in to publish your abstract in the Forum Conference Proceedings. The Conference Proceedings will be a collection of the abstracts which will be displayed as posters in Glasgow 2019. In order to feature in the Conference Proceedings, all authors with accepted abstracts must agree to the inclusion of their abstract in the Conference Proceedings and must register to display their poster during the conference. Email PDF to all attendees before the start of the International Forum. Publish PDF on the International Forum website and communicate via social media once the conference is finished. Include PDF in marketing emails and other marketing communications as required to promote future Forums. What is a video poster? The video posters are short videos where poster presenters discuss the nature and impact of their research/project which is illustrated on the printed poster they are displaying at the International Forum. If you are registered to present your poster in Glasgow, then you can send us a video poster, which we will promote via our marketing channels. Further information on video posters will be available shortly. How do I amend my poster or add co-author names? You cannot amend your original submission. However, you can make any changes to the final poster that you bring to the venue. How do I get a letter of invitation to support my visa application? We are only able to provide invitation letters to individuals who have registered and paid to attend the International Forum. If for any reason your visa application was unsuccessful we will be able to refund your registration fee in line with our terms and conditions and upon receipt of proof of unsuccessful application. If a letter of invitation is required to support your visa please contact us at events@bmj.com once you have registered. What do I do with my poster after the International Forum? Posters must be removed from the venue by 16:30. Any posters remaining will be removed by the venue and disposed of. Will I have somewhere to store any poster tubes/cylinders/cases? Unfortunately we have no space to store any items. Any poster tubes/ cases left in the venue will be disposed of. If you would like to re-use your case/ tube to carry your poster from the venue at the end of the event on Friday, we advise you to store this in your hotel or the venue cloakroom (you may have to pay a small fee, set by the venue).